West Grand's state wrestling tournament delegation poses for a quick picture. From left to right: Head Coach Brian Strathman, Gage Bonewell, David Santos, and Assistant Coach Scott Smith. Colorado’s annual high school wrestling championships will be held this week in Denver and, thanks to a successful season, four young athletes will represent both Grand County school districts at the elite tournament. Heading down to Denver this week to compete for a chance at a state title will be West Grand wrestlers David Santos, a sophomore wrestling at 106 pounds, and Gage Bonewell, a senior wrestling at 120 pounds. Representing Middle Park High School at this year’s state tournament will be seniors Dylan Kloss and Tel Linke. Kloss will be competing in the 170-pound weight class while Linke will be looking to bring home a heavyweight championship. 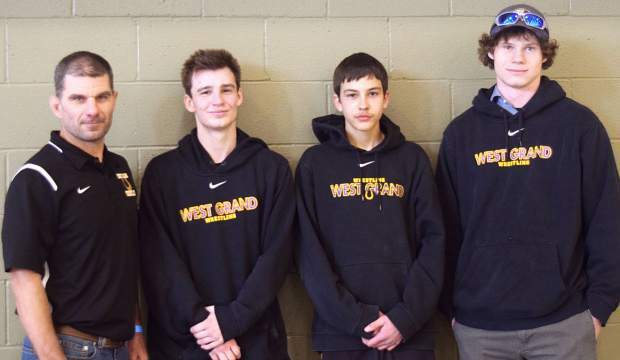 All four Grand County wrestlers who are preparing to compete in the state tournament qualified for the event at their respective regional tournaments, which were held last weekend in Montrose and Edgewater. West Grand High School sent a squad of seven to regionals in Montrose while Middle Park efforts in Edgewater featured 11 local boys. West Grand’s David Santos secured a spot at the state tournament after going 3-2 at regionals. Kremmling’s head wrestling coach, Brian Strathman, noted that Santos’ hard work over the past season paid off big for the young man. Santos went on to lose his fifth and final match of the tournament but secured his spot at state nonetheless. His first match of the tournament will be against the state’s top ranked 2A wrestler at 106 pounds, who hails from Fowler. Gage Bonewell of West Grand secured his spot in the state-wrestling tournament after a lighter than average schedule at regionals. Due to his past success and seeding at the tournament Bonewell received two byes early on. Following his byes Bonewell won a hard fought match against a Hotchkiss wrestler before falling to the number two ranked 2A wrestler at 120 pounds. Over in East Grand Middle Park’s wrestlers Dylan Kloss and Tel Linke are looking for a bit of redemption this year. Both boys qualified for the state tournament in 2018 but fell quickly, with both boys going 0-2. Kloss secured another state tournament berth by going 4-1 at regionals. 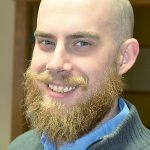 He was upset early in the quarterfinals, putting the young man in a tough position that required at least three straight wins to secure his state tournament slot. Senior heavyweight Tel Linke had an outstanding showing at regionals last week, going undefeated on the day and pinning all of his opponents. He made quick work of the number one ranked 3A heavyweight wrestler in the state, who is from Eaton, pinning him in under a minute. Following his quick work on his first match Linke went on to pin wrestlers from Elizabeth and Strasburg en route to his state tournament berth. “I am super proud to be sitting in each one of these wrestler’s corner,” Stuart stated.